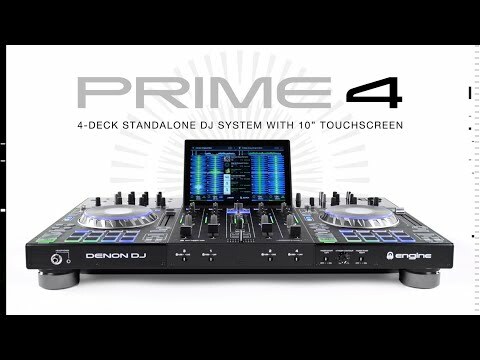 The Denon Prime 4 4-Deck Standalone DJ System is an incredibly powerful, all in one DJ system for professionals. The Prime 4 boasts incredible hardware, a 10-inch multi-touch display, vast connectivity, two 6-inch jog wheels, a powerful mixer plus the 24-bit Denon DJ legacy audio engine. Everything a DJ needs in one stunning package. Own every gig, crowd, genre and event! The multicore processor-powered Prime 4 ensures that your complete music collection is available whilst keeping out of the way of your performance. Complete with 4-deck hardware control and advanced touchscreen workflow, you can manage any DJ set, anyplace, anytime. The Prime 4 is something the global DJ community will love - a fully standalone 4-deck DJ system with no need for a laptop. Just a pure, performance and playback powerhouse! Rugged yet sophisticated. Access huge music libraries from four USB inputs, one SD and an under-panel, 2.5-inch built-in SATA drive bay for endless storage capability. You can also use any one of these media sources to record your full performance! You can also connect a USB Keyboard for optimised track browsing. Playback facilities include the ability to play uncompressed audio formats (FLAC, ALAC, WAV), Prime 4 caters for your entire music collection with connectivity that guarantees latency free access to your tunes. Import your digital music collections effortlessly from iTunes, Serato DJ Pro, Native Instruments Traktor Pro and Rekordbox using both Denon DJ’s free, Engine Prime music management software and the Prime 4 itself. Prime 4 is built on the legacy of over 25 years of premium Denon DJ audio engineering and manufacturing prowess, with rugged metal build quality surrounding the pristine 24-bit Denon DJ audio engine. Nothing sounds, looks or plays like the Prime 4 standalone 4-channel DJ System. In addition to an unrivalled sound engine, the Prime 4 also has powerful effects including 3 diversely textured DJ FX, sourced directly from the festival/club X1800 Prime mixer. A single encoder can be used to manipulate and filter sounds with incredible elegance. The class-leading timestretch algorithm allows DJs to perform pitch locked, extreme track tempo changes and match/shift harmonic musical keys on-the-fly with awe-inspiring precision. The Prime 4 all in one DJ system contains everything a DJ needs, beginners and professionals alike will find the Prime 4 intelligent, intuitive and stuffed full of high-grade features ready to take your mixes to sonically higher ground.